"TONIGHT, perhaps the most anticipated prize reveal of the year!!! 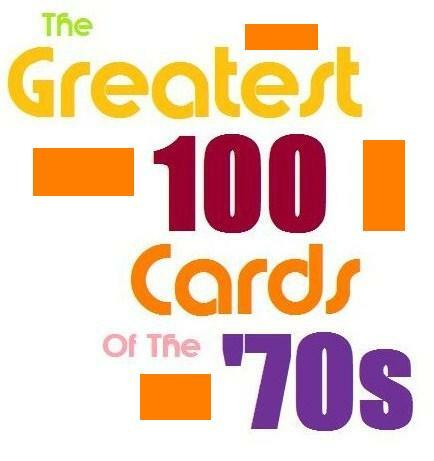 The results of my victory in Heartbreaking Cards of Staggering Genius' "Help Me Identify My Dumpster Cards" contest!!!! (golly, that's a lot of words). But enough talk. I wanna rip. Let's get this party STARTED! 2007 Topps Chrome, Joaquin Arias, Junk Autograph!!!!!!!!!!!!!!!!!!!!!!!!! Niiiiccce! 1 of 1! 1 of 1! 1 of 1! 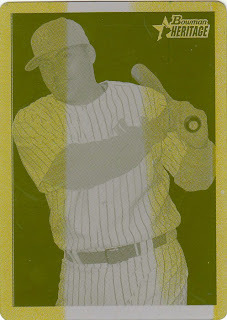 Printing Plate of a Yankee (Don't Get Your Hopes Up)!!!!!!!!!!!!!!!!! It's Omir Santos!!!!!!!!!!!!!!! We got it! We got it! WOWWUH! Jersey Relic from Allen & Ginter 2007!!!!!!!!!!!! Randy Winn!!!!!! Hello! Hello! Wow! 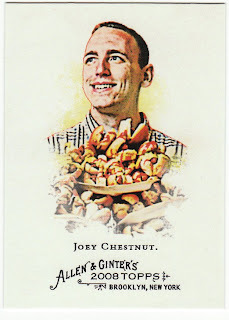 (Joey Chestnut does his gluttony thing). Jersey relic of a member of the Tampa Bay Rays World Series Team!!!!!!!!!!!! We've got another one!!!! Rocco! Rocco! UH-MAZING! 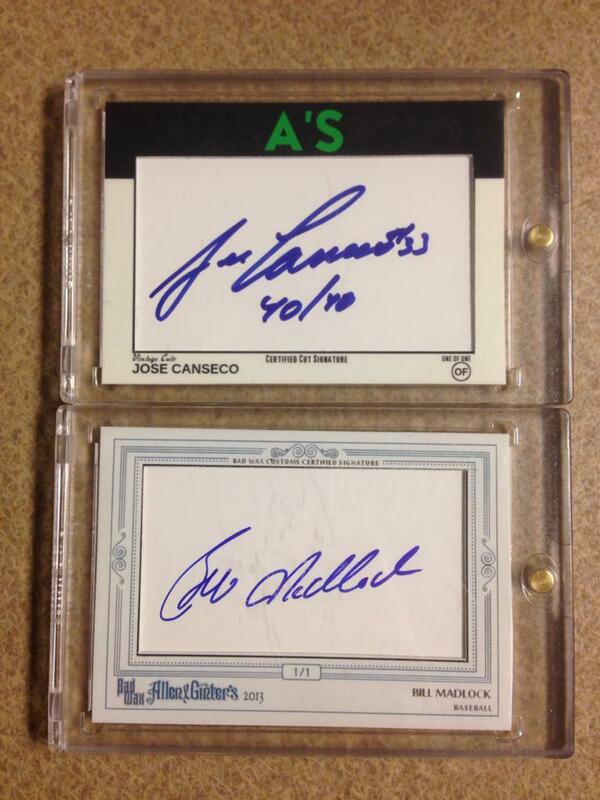 A Sweet Spot Signature of Someone Numbered to 99!!!!!!!!!!!!!! Casey Kotchman!!!!!!!!!!! Stoo-pendous! Seven Topps A-Rod Inserts!!!!!!!!!!!!! Niiiiiii--cccccccce!!! The crowd's going wild!!!!!! We've got it! We've got it! 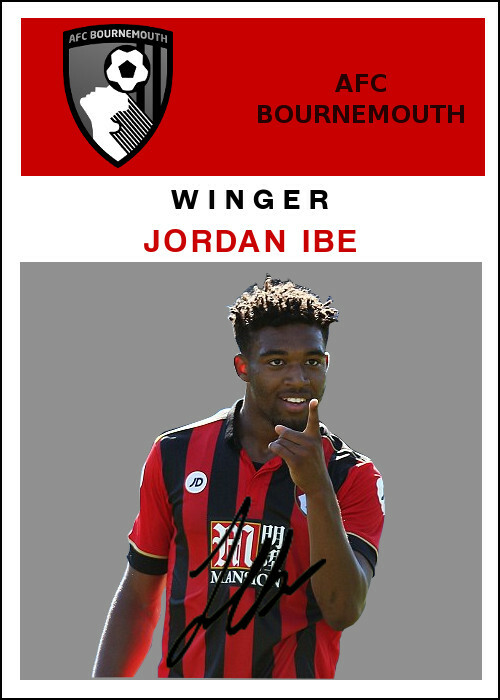 An Autograph Card Nobody Asked For But You'll Get It Anyway!!!!!!!!!!!!!!!! The Rip Master himself!!!!!!! We had some big hits tonight! The base cards were beautiful (wait a minute, there were no base cards)! The 1 of 1s OUT-standing! The inserts creative and innovative! These may be the best contest prizes EVER! 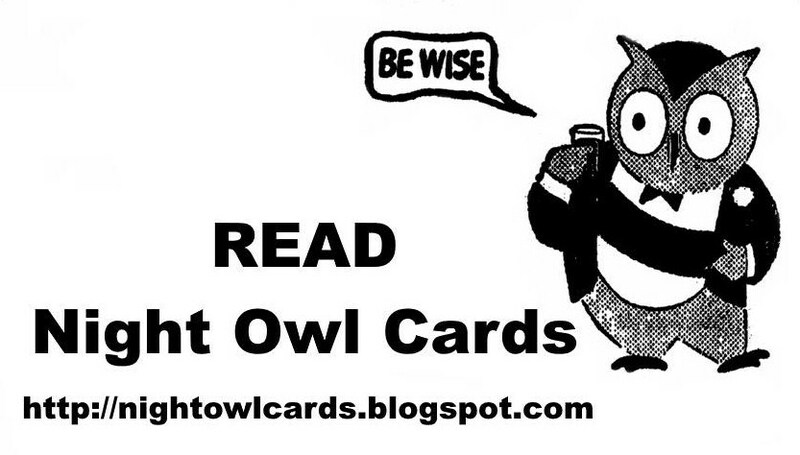 This is night owl, with his crappy impersonation of the Rip Master, saying keep contest entering!!!!" 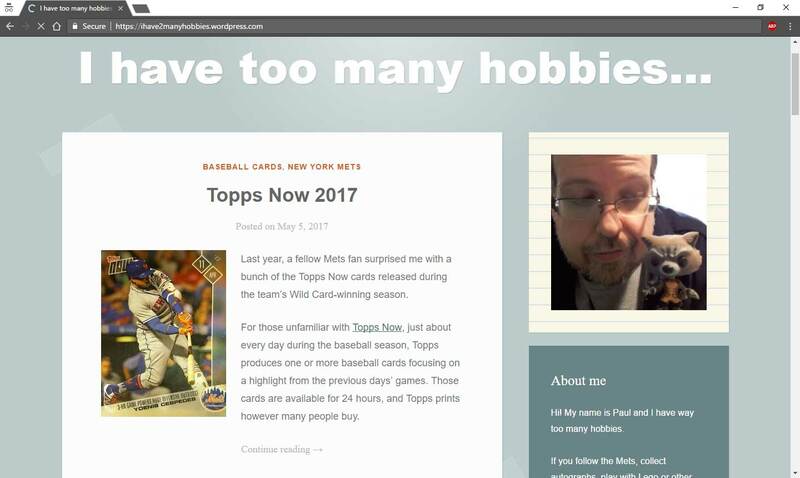 First of all, a big thanks to Matt F. for holding the contest and selecting me as the winner (I knew the set of cards in the dumpster were 1992 Topps. 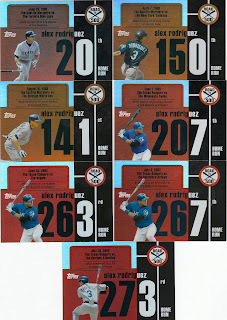 1992 was peak year for collectors thinking: these cards are going to make me RICH, and then going out and getting the whole set). 1. Junk Autograph from 2007 Topps Chrome (Matt did label the cards with his title for each prize. He must go through crates of post-it notes): Joaquin Arias. 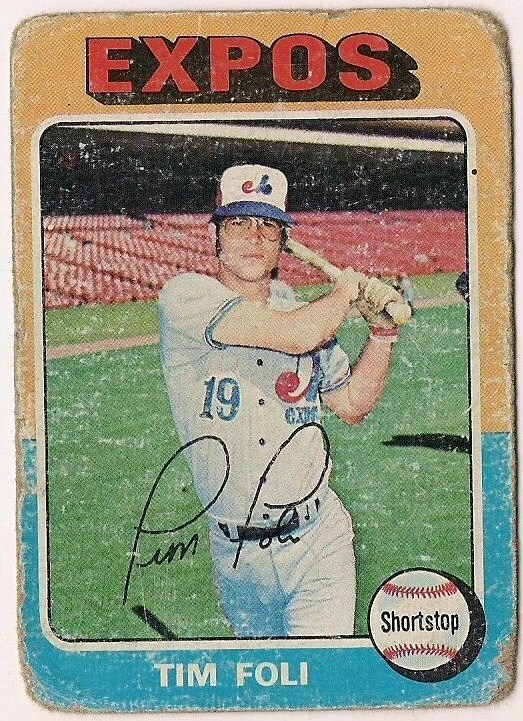 I only know of this guy through baseball cards. And in 2007 he seemed to be in the first pack I pulled for everything. But I do like autos, and I like chrome. 2. 1 of 1 Printing Plate of a Yankee (Don't Get Your Hopes Up): Omir Santos. Matt wasn't lying. Santos played in 10 games as a September call-up for the Orioles last season. He's 27 years old. 3. 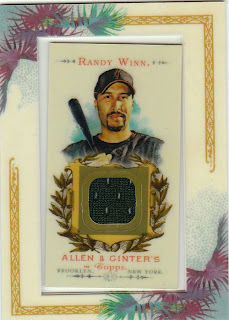 A Jersey Relic from Allen and Ginter 2007: Randy Winn. Despite it being a Giant, this is one of my two favorite cards from the contest. A&G can do no wrong by me. 4. 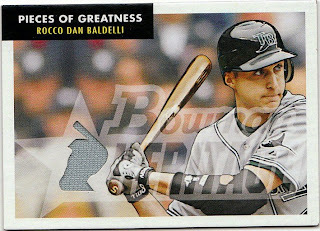 A Jersey Relic from a Member of the Tampa Bay Rays World Series Team: Rocco Baldelli. I like a relic of Baldelli, and I like 2007 Bowman Heritage. But in general, I'm indifferent about the '07 BH relics. 5. 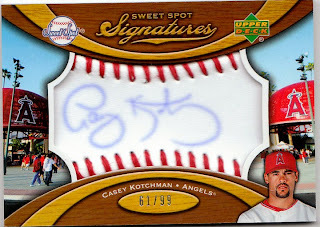 A Sweet Spot Signature of Someone Numbered to 99: Casey Kotchman. I won't lie, I really like this card, even though the fact that Kotchman's photo is no bigger than a quarter should make me want to throw it in my neighbor's composte pile. 6. 7 Topps A-Rod Inserts. Everyone's favorite series cards! 7. An Autograph No One Asked for But You'll Get Anyway. 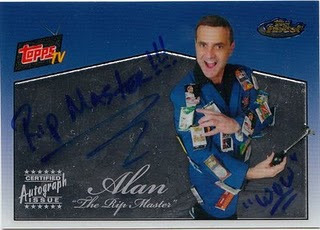 Yes, I really did receive the 2008 Topps Finest card of Alan Narz, "The Rip Master." No Rip Girls? :( ... I really don't know what to do with this card (and I have a hunch Matt didn't either). I am open to suggestions. All of these cards are up for trade. Since there are Rays, Giants, Rangers and Yankees in the mix, Dave from Fielder's Choice, Bailey from the Nennth Inning, Spiff from Texas Rangers Cards and Eric S. get first dibs. Just say the word guys, and I'll put these cards in your pile. 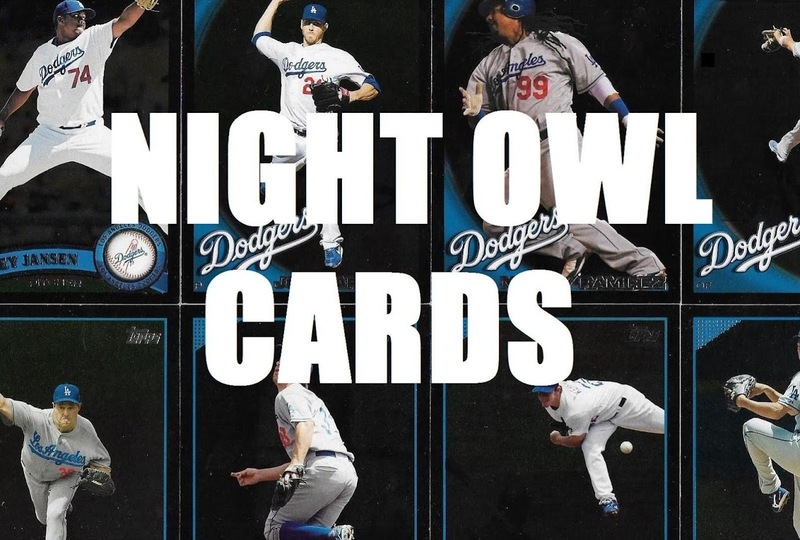 I'm not married to any of these cards, although the Kotchman card I'll let go of with a little more of a struggle. 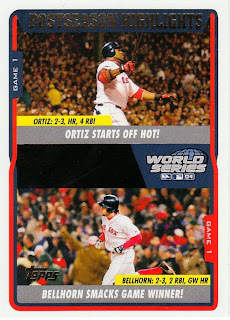 2005 Topps, World Series Highlights. 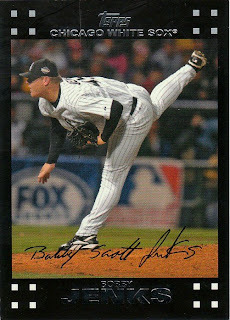 2007 Topps, Bobby Jenks, red-letter variation. 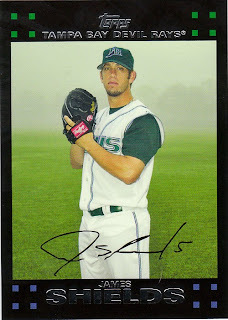 2007 Topps, James Shields. This isn't a night card, but Matt suggested I start a subset of sunset or early morning fog shots. I actually have a couple of twilight cards prepared for future posts. 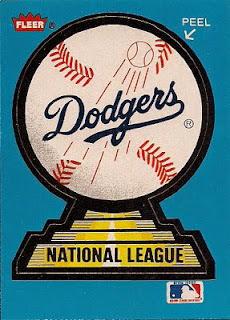 A Dodger sticker I do not have! 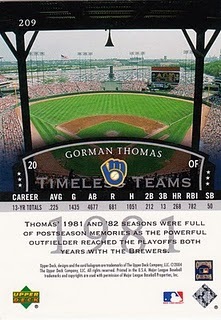 From 1989 Fleer. 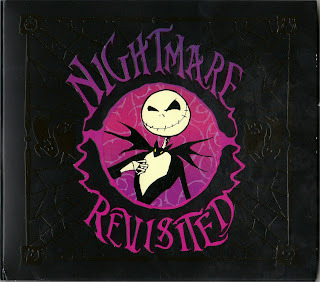 And, of course, the non-sport contest prize was the just-released Nightmare Revisited soundtrack, based on the Tim Burton movie the Nightmare Before Christmas. ("And since I'm dead, I can take off my head to recite Shakespeare quotations." My daughter's seen the movie). Quite a variety in this contest! And quirky enough to make me look forward to the next one. I'm sure Matt will make it interesting. Thanks again for making me a winner! I'd be happy to take the Rip Master card off your hands. Well, okay, any of the auto/relics will do - I will use them for either the next scratch-off contest or as fodder for next year's trick-or-treat giveaway!! I'll get ya some cards in the mail. OK, Dave, I'll be happy to send the Rip Master your way and some of the relics (if certain team collectors don't claim them). I think we need to start something with that Ripper Card to track where it goes throughout the card-iverse. It was born in Seattle, WA in the spring of 2008 out of a pack of Topps Finest. It then traveled to Lawrence, KS in July 2008 and then onto New York in November 2008. 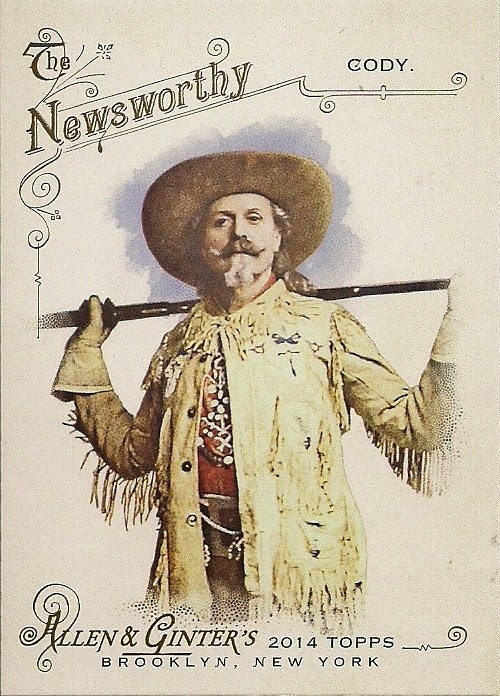 And now maybe onto Arkansas and who knows from there!...This card is destined for quite a life! That's a good idea, Matt. Now how do I attach a GPS device to this card? Hmmmm. What might it take to get the Arias autograph card? 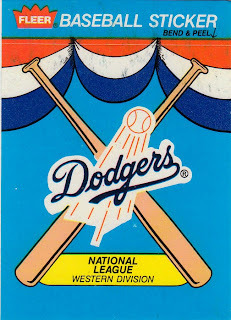 If you've got any Dodgers I'm interested. 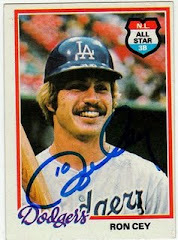 A Dodger auto or relic would be great, but if you don't have that, we can figure out something else pretty easily. Send me an email.